MFG Day 2016 itself may have passed, but there are still monthly celebrations of the American manufacturing industry going on. Our customer, the Hardinge Group in Elmira NY, held an open house on October 12th. The importance of MFG Day is to not only celebrate this industry but to pull the younger generation in to keep American manufacturing going. “We’ll be keeping an eye on these young stewards of the Manufacturing World,” Hardinge says. According to the Bureau of Labor Statistics, manufacturing was the industry with the highest employment in New York, where Hardinge is located, up until 1993. Manufacturing was also the dominating field providing the highest American employment rates from 1990 until the early 2000s. As of 2013, manufacturing was the provider of the most jobs only for seven States. The Manufacturing Institute has said that 3.5 Million manufacturing job vacancies will need filling over the next decade due to previous workers retiring and a jobs surplus created due to business growth, but sadly, 2 Million jobs are expected to sit unfilled because of a serious skilled labor gap. With a lack of resources for school children these days who are interested in STEM careers (science, technology, engineering & math), it is crucial that current members of the manufacturing industry step in to fix this problem. 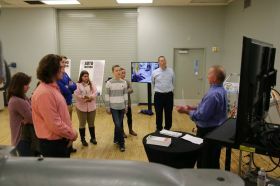 It is definitely appreciated when companies like Hardinge open their doors for the future generation to learn more about this industry. We have also seen similar efforts from our customers at Amarillo Gear Company. We hope that these efforts will help to occupy that skills gap and keep manufacturing in America. 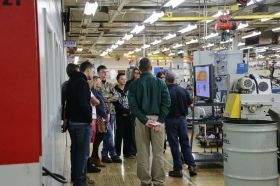 Read more of our MFG Day 2016 posts. Otherwise, tell us what you think via social media, or call (877) 611-5825 to share what is happening with your shop floor! MFG Day Comic was a Success Wondering what happened during your shift?